DVD Movies, Bringing You Both Entertainment and Embarrassment: It is said three-quarters of all adults would like to watch movies at home rather than a movie theatre according to a Pew Research Center survey. DVD enables people to enjoy the "big-screen" from the comforts of their home without paying much money or worrying about being late or missing anything. Nevertheless, discs easily get misplaced or damaged, and sometimes borrowed movies never make it back to the shelves. Do you want to save your investment? Wanna rip movies from DVD to watch them on your Mac or get movies off DVD for enjoying your favorite movies anytime anywhere? Well, this article satisfies you demand and tell you how to rip DVD on Mac computer with ease. Converting DVD movies on Mac computer is hassle-free as long as you own a professional Mac movie ripper. However, many DVDs nowadays come with copy protection, making you impossible to get movie off DVD. In other words, you must first decrypty DVD on Mac and then rip movies from DVD on your Mac OS. Here MacX DVD Ripper Pro is highly recommended and acclaimed by vast Mac users for its straightforward interface and fast ripping speed. This reliable DVD ripper for Mac is equipped with unique DVD Navigator Analysis technology, which enables you to access all types of copy protected DVDs, such as Sony ARccOS encryption, Disney new copy protection, CSS encryption, etc, letting DVD ripping happen without any hassle. This Mac movie ripper has also upgraded to support ripping movies from DVD on the latest version Mac OS 10.11 El Capitan/macOS Sierra. Free download and run this DVD movie ripper for Mac OS Mountain Lion (El Capitan included), click "DVD Disc" or "DVD Path" button to import the DVD movie on your Mac. Select the output format as you want. With the help of Mac movie ripper, you can easily rip DVD movies to the video formats you desire like MP4, iTune, MOV, Music, MPEG, etc on your Mac. Click the "RUN" button to start ripping movies from DVD on Mac. You can view the whole progress and are able to cancel it at anytime. Besides ripping movies from DVD on Mac, this DVD movie ripper for Mac program also performs the fastest DVD ripping solution which features converting any DVD to variety of formats, including MP4, H.264, MOV, FLV, MPEG, M4V, AVI, QT, etc. It helps you easily watch any DVD movies on Mac, iPhone (include iPhone 7/SE/6s/6 etc. ), iPad (iPad Mini included), iPod, Apple TV, PSP, QuickTime Player, etc without third party assistance, thus making your DVD collection more mobile. 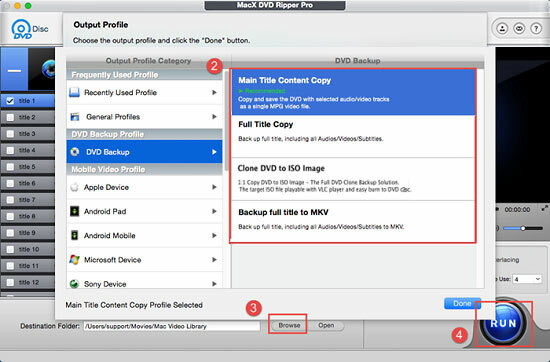 What's more, MacX DVD Ripper Pro also boasts feature that allows to copy protected DVD Mac. The quality of copy it produces, specifically, pushes it into the top product as it creates a perfect 1:1 copy of the content with a few minutes. Notice: We only advocates using this best DVD ripper to rip movies from DVD on Mac under the concept of Fair Use and does not encourage any illegal reproduction or distribution of copyrighted content. Please abide by the local DVD copyright law before doing it.